Business and finance advisory firm Grant Thornton has welcomed a bumper crop of new trainees and promotions to its Birmingham office. 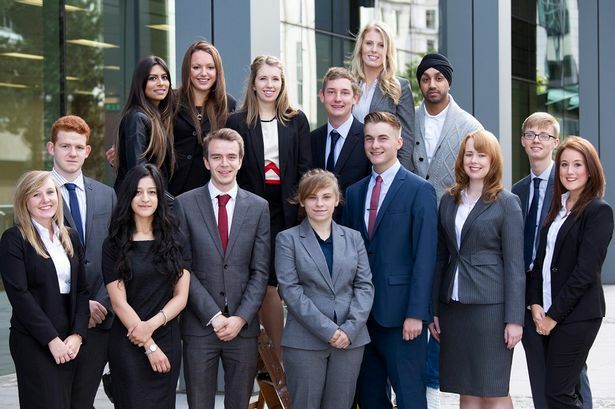 Eleven graduates and seven school-leavers have joined Grant Thornton&apos;s growing Birmingham office and will study for a wide range of professional qualifications while working across its audit, tax and advisory businesses. Following its summer intern programme, the office in Colmore Plaza has also taken on two students on a 12-month placement scheme. Next year the company will launch a work experience programme across the UK. Kathryn Godfree, office audit leader who oversees the local trainees&apos; programme, said: "This year, Grant Thornton received over 11,000 applications for 400 national training positions so competition is incredibly tough and only those who can demonstrate a comprehensive understanding of our business are successful in gaining a place. "These trainees have shown all the right qualities to embark on a career to become a trusted business adviser working alongside our dynamic and ambitious clients." Grant Thornton&apos;s Birmingham office has also promoted 20 individuals to management positions or above across commercial audit, corporate tax, entrepreneurial private client tax, advisory and public sector audit teams. Birmingham-based Dave Munton, regional managing partner, said: "It&apos;s great to welcome so many budding business advisers to Grant Thornton, as well as celebrate the promotion of our talented people. "Without exception, these individuals possess not just high levels of technical ability, but also enthusiasm and a real dedication to helping our clients achieve their ambitions for growth, both at home and abroad."